VietNamNet Bridge – Though Viet Nam’s famous traditional dress has taken many forms over the centuries, its allure and appeal has never died. 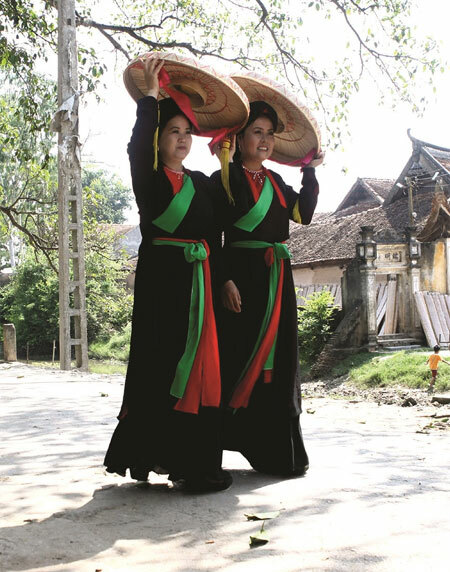 People all over Viet Nam are familiar with poems featuring the beauty of the country’s national dress, the ao dai, its slim-fitting tunic with long side splits from the waist, worn over palazzo-style trousers. The traditional woman’s dress has been mentioned in many poems, stories and songs for centuries. "The fragrance of three regions, the fragrance of flesh. The ao dai is considered by Westerners to be one of the most elegant and feminine national costumes in the world with its close-fitting bodice, free-flowing front and back panels, and long silk trousers. It is a delicate and airy garment. But many people are unaware that it has undergone many transformations over the years to reach its current form. Its evolution dates back to the 19th century, when it was born from the ao uứ than (four-flap dress), a loose dress worn outside a white thin blouse over a halter, along with a fabric belt. The Vietnamese at that time wanted to simplify it and joined the two narrow panels, setting the stage for the very first appearance of the modern ao dai. In the 1930s, it was transformed into a gown with two elegant panels reaching to the ground, fitting the wearer’s body by using pins and a nipped-in waist. It had a raglan sleeve based on Western fashion techniques, which eliminated the clumping of material under the arms of the ao dai, bringing it a step closer to its current form-fitting style. Until 1958, the ao dai was a daily outfit in the North, but by that time, it had fallen out of fashion in the trendier South. Tran Le Xuan, the wife of a brother of the former president of South Viet Nam Ngo Dinh Diem, infamously known as the “Dragon Lady”, made a fashion statement by wearing an ao dai with a bateau neckline and snug upper body, influencing nearly all Southern women to wear the style. The bateau style remained popular until the 60s when the hippie trend reached Sai Gon, and knee-length panels then became de rigueur. Following reunification and post-war depression, fabric became more expensive, so women shifted to the ao ba ba, a simpler version of the ao dai with the flaps ending at the hipline and a front button used for access. The ao dai was then relegated to use for special occasions and diplomatic events. In recent years, artists and people who love the costume have managed to resurrect its use in daily life. For three consecutive years, the southern commercial hub of HCM City, for example, has organised the ao dai festival to preserve national traditional culture and embed the national dress in the cultural and spiritual life of its citizens. 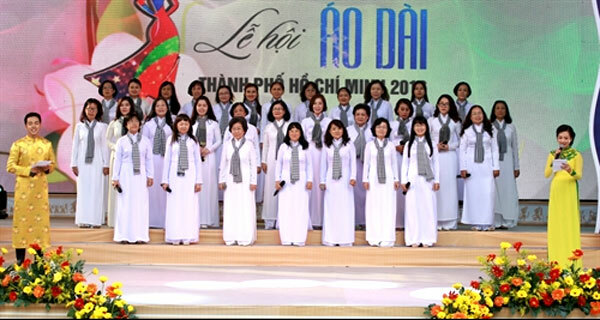 During this year’s festival, which was held over one month, the city encouraged its residents to wear the ao dai every day. 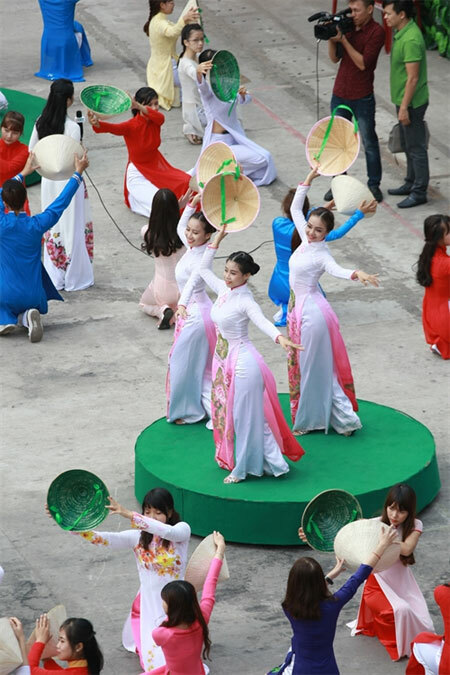 “Vietnamese women should wear the ao dai at school and at work as well,” Dang Thi Truc Linh, a senior at the HCM City University of Social Sciences and Humanities, said, while working as a volunteer at the opening ceremony of Ao Dai Festival 2016. “Though these long, flowing panels are something of a hazard when riding a bicycle or sitting side-saddle on a motor scooter, the ao dai’s advantages far outweigh its drawbacks as it helps to hide unshapely legs, thick ankles and knobby knees,” Linh added. However, Tran Thi Tu Uyen, a journalist at the Phap Luat newspaper, said that if the city requested every female official to wear ao dai to work, she would obey. “But my career requires a more modern costume, like jeans,” Uyen said. “The plain white ao dai can be a common uniform in high schools as wearing it can teach students how to behave. It can impart modesty, caution and refinement. Anh said that many competitions over the years have been held to choose the country’s favourite national costume. 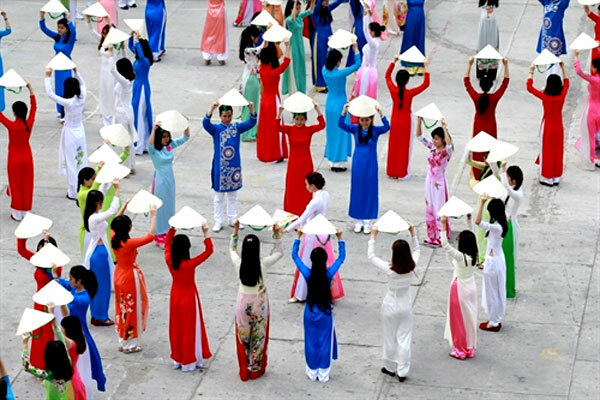 In an online discussion recently held by a local newspaper about whether female students at high schools should wear the ao dai, some readers said they were disappointed that uniforms had changed to shirts and skirts or a shirt and trousers in a variety of styles and colours. Others said wearing the ao dai in hot weather causes difficulties for students. School uniforms should be aesthetically and climatically appropriate, and simple and cheap, help girls be comfortable while they study at school. Ao dai can be worn on Mondays when they take part in the flag-saluting ritual, or on national holidays. “If people wear ao dai in daily life, the dress’s beauty and significance tends to be less appreciated as the national costume,” Huynh Trung Nghia, 55, said. Famed ao dai designer Thuan Viet said that the ao dai at schools should be made with moisture-absorbing materials and have several adjustments, including a low upright collars, looser-fitting tunic and shorter and narrower pants. “We should have a 2-cm collar, and flaps ending at 15cm at 25-cm wide cuffs for the convenience of female students,” Viet added. 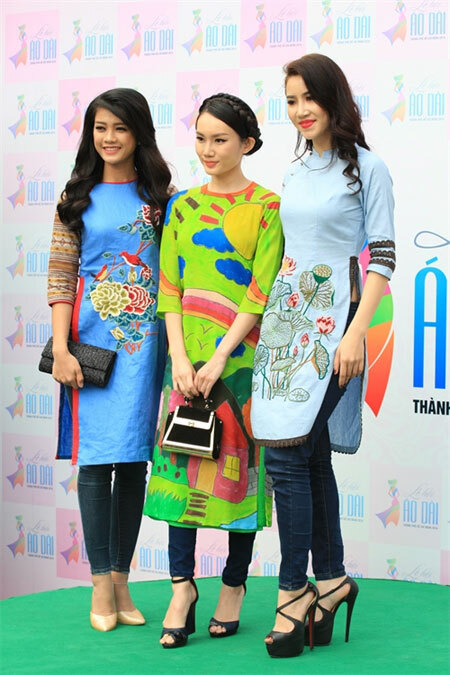 Sy Hoang, a well-known designer whose name is connected closely to the ao dai, said people were now thinking of modernising the ao dai. But the dress has already gone through a period of modernisation. “The ao dai, traditional but not conservative, has always been modernized to meet the aesthetic taste of people in each period,” Hoang said. Since 1997, Hoang has shown his ao dai designs in 20 countries. In 2006, one of his collections is on permanent display at the Museum San Jose of Quilts and Textilles in San Jose in the US. Hoang has introduced his ao dai collections that combine traditional ao dai with costumes of other countries, including France, the US, China, Japan, the Philippines Singapore, South Korea, and India. Duong Thanh Thuy, a representative of the Trung Thuy corporation, which is well-known for the brand Miss Ao Dai, said she was embarrassed when tourists ordered traditional ao dai as there is no clear definition about what a traditional ao dai is. Despite the disagreements over the design and definition of the ao dai, many people, as well as the government, want to continue to show off their love of the national costume. Last year, Nguyen Thi Thu Thuy, also known as Juliette Nguyen, who attends the William Angliss Institute in Melbourne, created a fanpage on Facebook named “Ao Dai around the World”, encouraging people to send photos of themselves wearing the traditional Vietnamese costume. “This is a community project of a young girl who loves her traditional Vietnamese dress and wants to share it with the world,” her Facebook page says. Every day, the page posts about two to three photos with captions depicting the readers’ stories. So far, 3,595 Facebook users have liked the page and have uploaded thousands of photos capturing the ao dai in 40 countries.